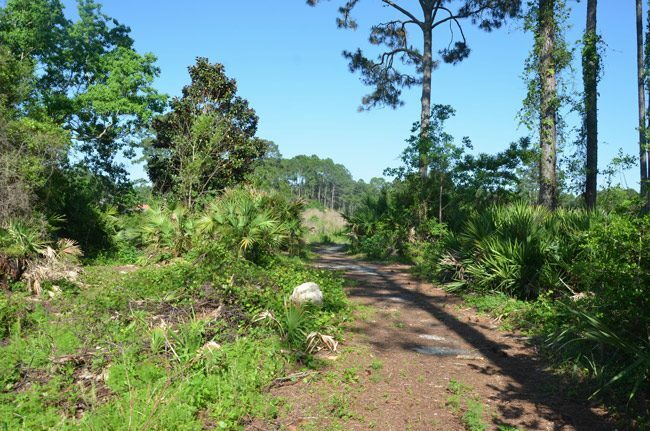 When the matter of the Matanzas Woods golf course’s foreclosure last came up in Flagler County Circuit Court on May 31, the golf course’s owners were a no-show. The next day, Circuit Judge Scott DuPont signed an order striking what defenses the golf course owners had produced (and not produced), handing Palm Coast government a victory. The next step would be judgement of foreclosure, which would then presumably enable the property to be auctioned off. On Thursday, Palm Coast moved for a final judgment of foreclosure based on liens and money owned: $58,553 to the utility department and $170,138 in fines due Code Enforcement, for a total of $228,691. The Matanzas Woods golf course has been a thorn in Palm Coast government‘s side and that of residents surrounding the golf course, who have pressured the city to act. Residents have been unhappy with the state of the disused golf course, blaming it for damaging their property values and opportunities to sell. The city followed through, at first attempting to resolve the problem by compelling the course owners to better maintain it, then last spring filing suit to foreclose. The golf course is owned by attorney Michael Yokan and Stephen Richardson, who bought it under the name of Group Golf of Palm Coast LLC some three years ago for $266,800. They were sketchy last year about their plans for the course. The city has not required chemical treatment, however, merely maintenance. That lawsuit has not been scheduled for a hearing. It is also in circuit court, before DuPont. Palm Coast’s likely answer is a motion for dismissal. After Palm Coast filed suit in 2016, the group responded last February in an eight-page filing that the city was acting illegally. It claimed, for example, that it did not use utility services as the city says it did, making the utility lien invalid. The group then denied having not paid utility fees and demanded proof that it had not (proof the city provided in line by line detail). It took much the same approach regarding the code enforcement lien, again disputing that it was not in compliance with city codes, and challenging the constitutionality of the code as applied to the golf course. (The city’s Code Enforcement Board ordered foreclosure of the lien on March 17, 2016). Code enforcement liens have the same power to be enforced as any court judgment. The city proceeded along those lines. Group Golf’s position is that the acreage should simply be treated as vacant property, “and not a functioning golf course.” The group then alleges that it was being treated differently than other real estate developers, “including Jim Cullis, the course of the code enforcement complaints which led to the purported fines and lien in this case,” the group states in its answer. Cullis had tried previously to buy the property from the group. He would now be positioned to take ownership of the property through foreclosure. (Brad West, one of the residents around the golf course, has chronicled some of the history in detail here.) The group also included allegations that the city had violated its due process. Palm Coast disagreed. In a six-page answer of its own–a motion to strike the Group Golf’s affirmative defenses–the city argued that Group Golf never so much as appealed the decision of the code enforcement board, which in essence–according to the city, based on legal precedent–invalidates the group’s subsequent claims. “Because [Golf Grop] failed to appeal the code enforcement board orders, [Group Golf] waived the right” to constitutional defenses, while the circuit court “lacks jurisdiction to address the defenses.” The city asked the judge to strike Group Golf’;s defenses, which DuPont did. Group Golf could have made its arguments before the judge on May 31, when a hearing was scheduled, but did not show. The group was represented by Christopher Wickersham Jr., a Jacksonville attorney. We live on the course and the whole thing is very shady. Cullis has been trying to get his hands on it for years. He is a real estate developer and the homeowners here do not want any houses. It costs a lot of money to keep it mowed and pay the annual fees to St. John’s Water Management District. What’s strange is when the course was kept mowed the city started fining the owners. It’s been kept decent, in fact the fairway behind my house was being mowed yesterday. The photo in the article is very misleading. It is of a section of cart path that is away from a fairway. I’ll be glad to email you a photo of the course behind my house. golfing is such an old school sport now why would anybody want to live near one the prestige is no longer there AND there are FAR too many in Palm Coast. Isn’t golf like watching paint dry? Thanks for the article about this important matter that has impacted so many residents for years. Its not so much about golf anymore as it is about land usage, quality of life and property values. The owners even said in their affirmative defenses they had no plans to make it a golf course again. Recently, I noted as ad for a golf course home in Matanzas Woods. Its a nice, quiet area but it is not a golf course community and has not been for almost 10 years. Even if it was to be a course again, it would have some homes built around it. The city has said they will protect the views of existing homes on the property. When I read an article about the Matanzas Golf Course. I think what a beautiful golf course it had been. I feel bad for the homeowners surrounding the course. It wouldn’t seem likely that Matanzas will ever be resurrected. Golf courses for the most part are bad investments. Too bad the homeowners couldn’t form a group to buy the course. Then the homeowners and the city of Palm Coast. Workout a plan to make this happen. It was never about golf, and that has been the problem. Some residents made it about golf and golf advocacy. This has always been a problem about the impact on the properties surrounding the former golf course property. A good solution was put before this community over 2 years ago and a group of residents very actively worked to squash the conversation and any possibility of an alternate use of the property (a linear park) insisting it had to be a golf course. Those of us who live here could have had so much more by now, but unfortunately a selfish few put up barriers to a solution. One of them was a part-time resident, two others have since moved away. Go figure. I think that there was a lot of misunderstanding going on between the residents, the city and the owners. The vast majority of residents still wanted their course. As a matter of fact, 90% signed a petition to bring back the course. There were a few who wanted Mr Cullis to develop the property immediately. They were dominated by the realtor community. I think they thought they would make more commission if it were a park and houses. However, any course restoration would have also have included homes and they would have been more valuable golf course homes. We were offered the property by the original owner for $200k. No one could get it together to buy it. A city council person related to me that the city manager would never allow restoration because it would compete with the inferior city owned course a few miles away. Mr Meeker worked tirelessly with us to find a solution. In the end a restoration was not economically possible. However, all bases had to be covered. Hopefully, the apathy and animus of neighbors will fade and they can work with the city to solve this vital issue. If we would have worked together, this could have been resolved years ago. Yet again, the Matanzas Woods Golf Club is e n c u m b e r e d by a Federal Consent Agreement ; more specifically Federal Trade Commissions’ ORDER – Consent Agreement F.T.C. C-2854 and Federally ORDERED ‘…15 Year Compliance Report…’ of which it is many times named and identified within the Federal ‘ Exhibits ‘. I hope that the plans to make an organic farm are successful. Palm Coast and Florida have plenty of golf courses. The opportunity to have clean, nutritious food grown right in the community would be invaluable. Forward thinking communities around the country are waking up to the FACT that our current food/farming system is not sustainable and makes both us and the land sick. We have a chance to be ahead of the curve. I would bet heavily that a working organic farm in the middle of the community would add more tangible value to the city/county/residents than another golf course, as well as many intangible benefits. Hey Nick, I bet you don’t live in the former course. We don’t want a friggin organic farm in our backyard. charging a business $170,000 in fines? No wonder they are broke! Wonder if the city will fine itself after it forecloses and doesn’t keep it cut! Now comes the defendant! They showed up and filed for a re-hearing! Owners were stuck in traffic on I95. Per their affidavit, they were only 19 minutes late and had called the court to notify the court of an accident and subsequent traffic jam. They are still due their day in court and due process. I live on the old course with a piece of the fairway a cart path and a green on the other side behind my home. I don’t care about it ever being a golf course again. I would much rather the land be used for a park. Building more homes is not the answer. We have already lost tons of money on property values here, so, more homes is not the answer. A park would be just fine. Oh before they build it, could they please kill the water moccasin den? I’ve killed about 1000 so far. Thanks. JM who is going to pay to keep a park up? At least a golf course has income.